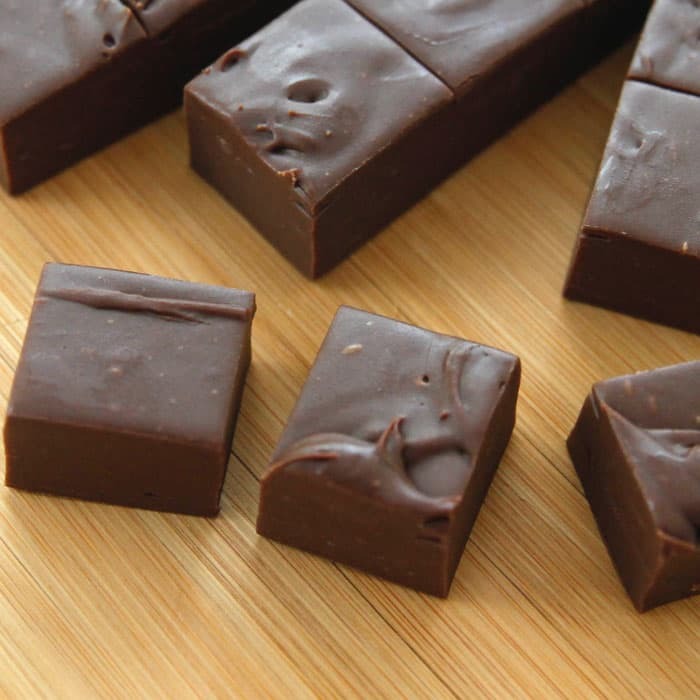 Just 3 Minutes and 3 ingredients to rich, creamy fudge that will melt in your mouth! There are times you just crave chocolate. Chocolate Fudge. You want it now. Not in a few hours. And it’s summer. It’s hot. I really don’t want to spend any more time in the kitchen than I have to. Use a large microwave safe bowl. I love using my Large Batter Bowl because of the handle. And I have to mention my pretty Gir Spatula . I have it in several colors. And sizes. I use them for everything. 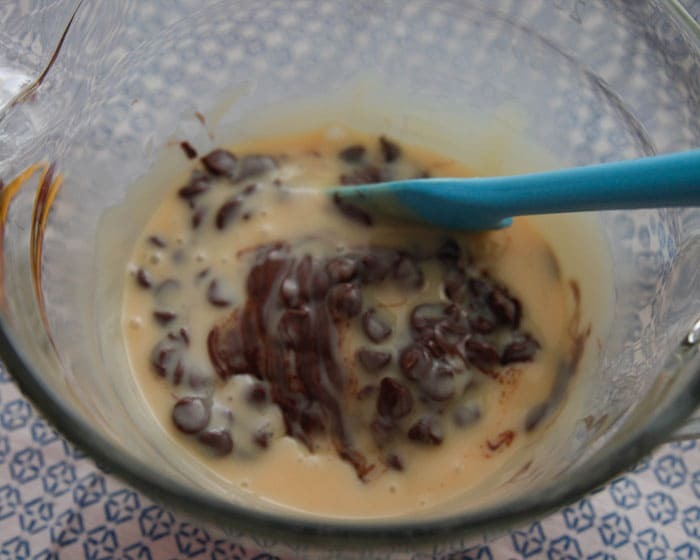 Anyway, place your chocolate chips and sweetened condensed milk in your bowl. Heat for 1 minute on high in the microwave. Then stir. And stir. If needed, heat for an additional time, at 30 second intervals. Until smooth and chips are completely melted. Stir in extract then pour into a prepared pan. I like to line my pans with parchment paper so I can lift out the fudge and cut on a cutting board instead of in the pan. 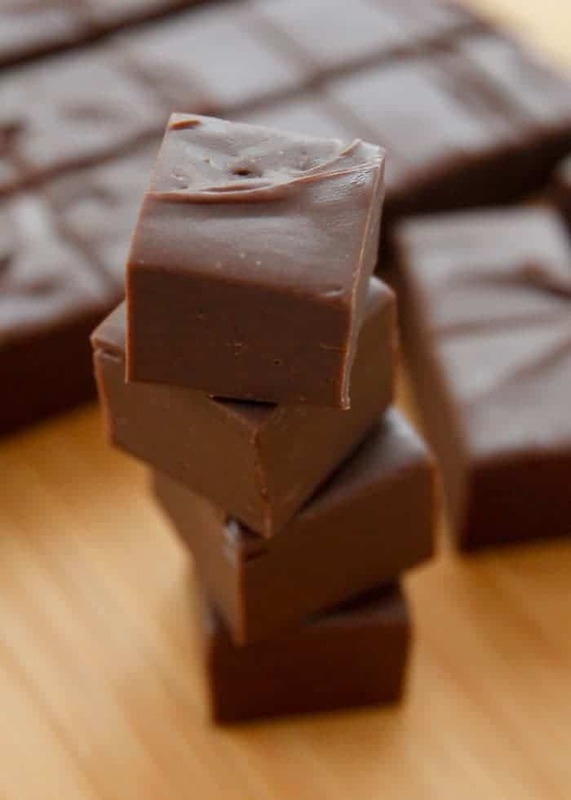 3 Minute Fudge with just 3 ingredients. Nutrition information is provided as a guide only. Please consult a dietitian if you have specific dietary needs. You can also make non dairy sweetened condensed milk by gently simmering any plant milk mixed with sugar, on the stove for about two hours until it’s reduced by half. Have a hunt around and see if you can find coconut condensed milk. It is starting to come on the market here (have seen a few parents posting about it in a local allergy group) and getting ok reviews. I haven’t tried it myself though. This is a fantastic recipe! My family gobbled this fudge up in no time. I am wondering though, can this be made using white chocolate chips? 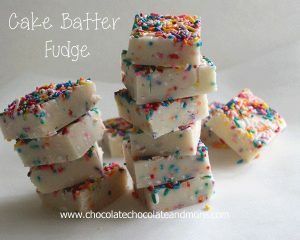 I’m looking for an easy white chocolate fudge recipe to make tie dye fudge. Thanks! Yes, you can use any flavor chip you like! Hello, Joan. I just found you via a search for “Seven Layers of Love” cookie bars and am now wondering where you’ve been all my life? 🙂 So glad to have discovered a fellow mom/chocolate-lover/housecleaning and gardening avoider! Thank you for providing me with an “answer” to my search via your Seven Layer Magic Bars recipe. I’m including a link to it in a blog post I’m working on at this very minute! So glad to meet you Elizabeth, we chocoholics need to stick together! I have been making this fudge for over 10 years. 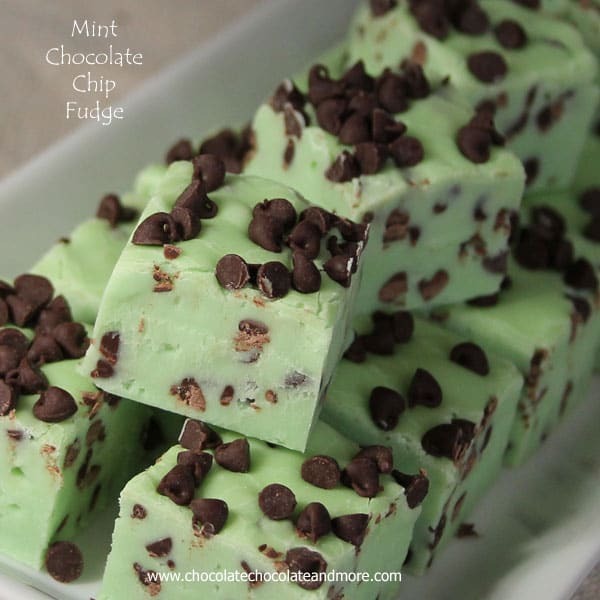 I add 1/2 box of junior mints when I melt the chocolate chips and stick the rest of the box on top after it has been cut, the ones that don’t end up in my mouth!! This recipe is so easy and not sicky sweet like most fudge recipes because no sugar is used. Love junior mints, can’t wait to try it! HI Joan! Does it matter if I use fat free sweetened condensed milk in this recipe? I am thinking of making my own, and cutting down on the sugar. Hi Joanne. I’ve used the fat free SCM before and it worked fine. 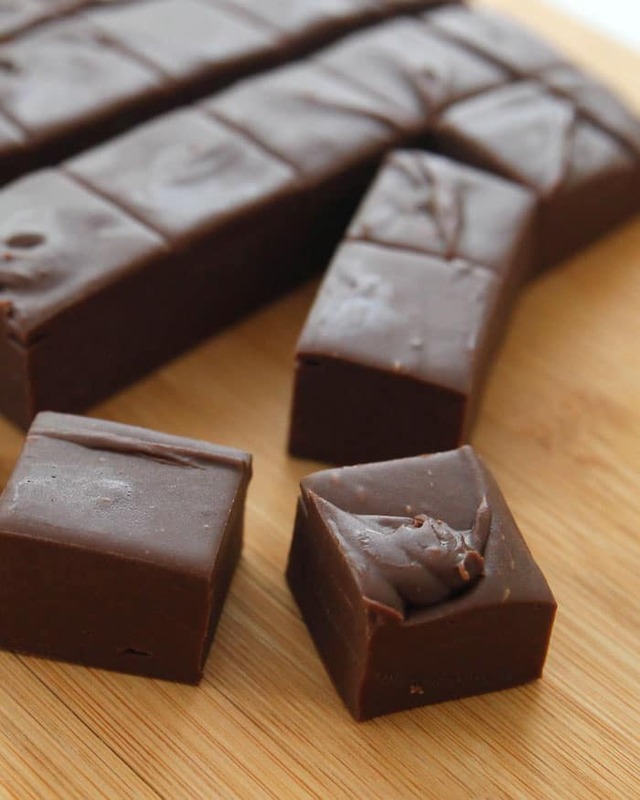 I’ve been making this fudge for years and it works with either kind. Thanks for letting me know Cheri, now I can have a little less guilt when I eat 5 pieces at a time! What size pan are you using??? I use an 8×8 square pan. I have also made this recipe with peanut butter chips. 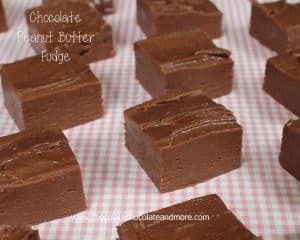 And stacked the peanut butter fudge with chocolate fudge. Love it. Delish. Here’s a variation that I make. Swap the vanilla extract with almond and add about 1/4-1/2 cup chopped maraschino cherries. So yummy! Would mixing in some chopped pecans or other nuts work with this recipe? Hello! 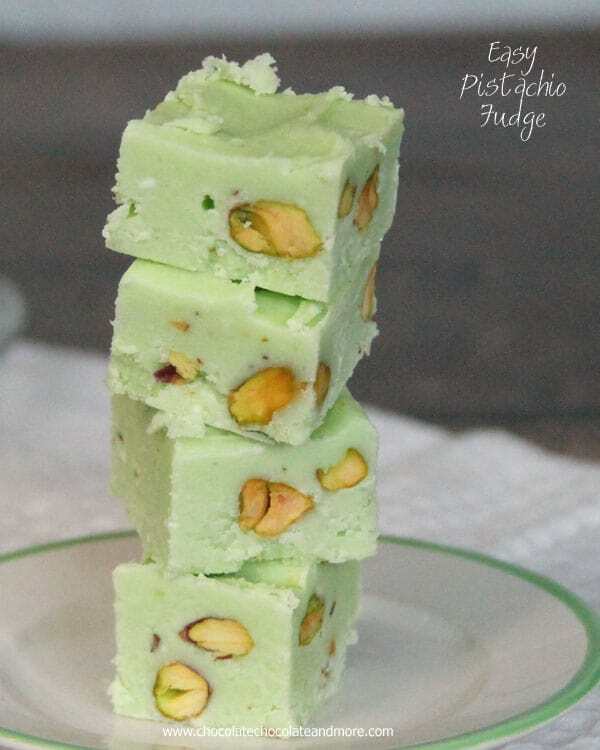 What’s the consistency of this fudge after it’s done? Does it harden in the fridge or does it stay soft? Thanks! 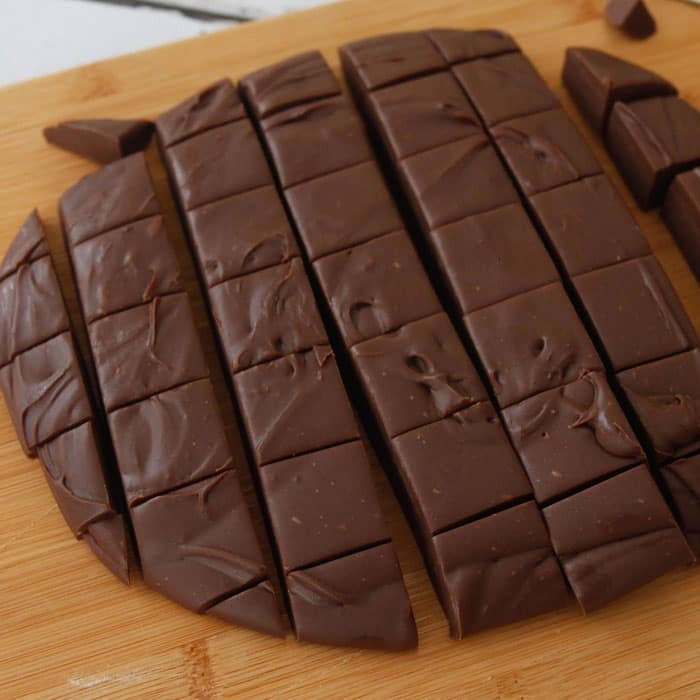 This is a soft fudge but it’s firm and will hold it’s shape when cut. Been using this for years. Adding coconut, pecans, and/or marshmallows adds a little something extra. Adding marshmallows makes the fudge much thicker, requiring a deeper dish. I use pie plates. It didnt set for me, its been in the fridge for 8hours + and the top is only just set its still soft sticky the way it was when i poured it out. Any ideas what went wrong or how to fix it? Melt it again and add more choc maybe? Did you use sweetened condensed milk? 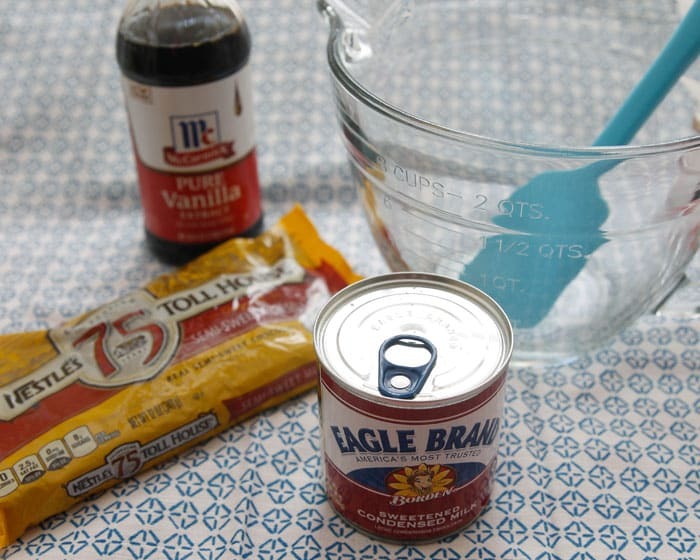 Many people confuse sweetened condensed and evaporated milk. Do you think adding 1/2C peanut butter to this recipe would be ok? Looking for an easy way to make it peanut buttery! Adding 1/2 cup of peanut butter would make this delicious! I’d stir it in with the chips and sweetened condensed milk while the chips are melting. I don’t have a microwave oven. How can I adapt this recipe for a conventional oven? You can melt your chocolate chips using a double boiler on the stovetop and then proceed with the rest of the directions. I made this fudge yesterday and put it in the fridge to set overnight. The top is set but the rest of it is still sticky and squidgy the same as it was when I poured it into the tray. I used SCM and followed your recipe to the work – any idea what I did wrong? I’m so sorry your fudge didn’t turn out. Did you use a full 2 cups of chocolate chips (a 12 ounce bag)? Yes I did use a full 2 cups – it’s now set after 4 days in the fridge. 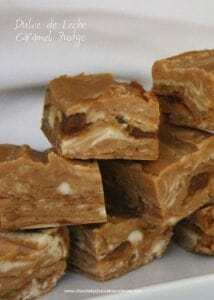 ive used the three ingredient fudge recipe for years. My only issue is how to get the cuts to look as good as yours. Can you take us through the process of how you cut up your fudge? For the best cuts, I remove the fudge from the pan to a cutting board. Then I use the largest, sharpest knife I own so it’s one straight cut down (a chop motion straight down.) 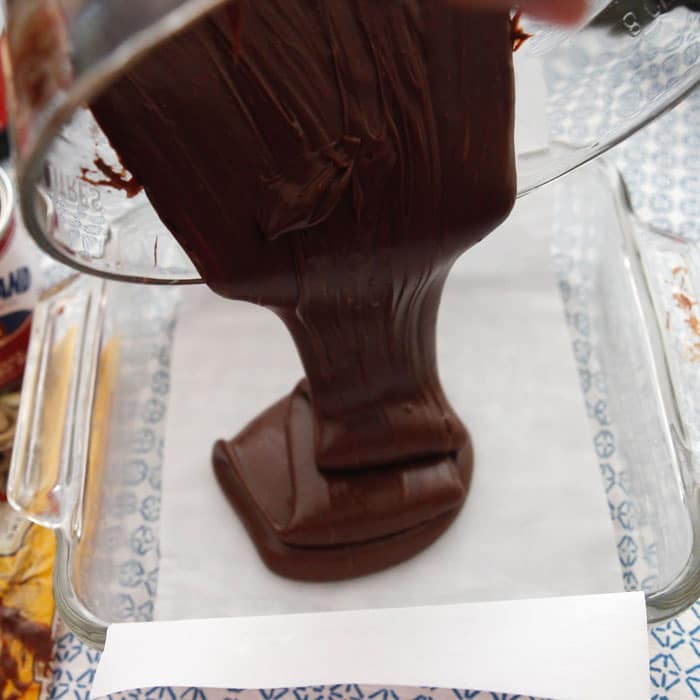 If your fudge is sticking to the knife, you can lightly butter the knife to prevent sticking. I have discovered that a plastic knife is awesome when cutting fudge !!! This might be a little heavy to spread on a cake, You’d be better off making a chocolate ganache for a cake. Joan I had all ingredients in the house and decided to make these and they were fabulous! I also threw in some chopped pecans. I can’t get over how easy it is to make these. I’ll be sharing a link to this recipe later this month, it’s just too good not to. OMG! 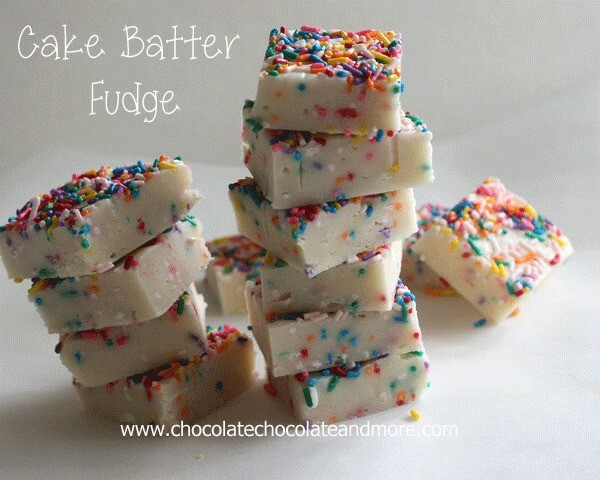 Thank you for this recipe and the cake batter fudge one too! It is delicious!! Hello, sorry for asking but I am European and I use metric, so I have a problem to understand the weight of 1 12 ounces. I can convert the 12 ounces to grams but I can’t understand the “1”. Is it 1pound and 12 ounces? ATotal 28ounces (800gr)? Thanks. It is one 12 ounce bag of chocolate chips. Hi, can you tell me why you need the vanilla when you are making chocolate fudge? Isn’t chocolate the flavor you want the fudge to be? You can leave the vanilla extract out but adding it actually amplifies the chocolate flavor. This. was. PERFECT! I threw some sea salt on top and called it a day. I felt bad stuffing my face while my lactose intolerant boyfriend observed longingly, so in my next batch I used dark chocolate chips (Ghirardelli cuz he’s a diva) and extra creamy coconut cream from Trader Joe’s instead of milk chocolate and sweetened condensed milk (which is my ABSOLUTE favorite.) It worked out really well. I added about 8 teaspoons of sugar to the coconut cream to thicken it up before we heated it in the microwave and let it sit overnight in the fridge. It was perfect. I’ve never seen him devour sweets in such a prolific manner. Thanks for the great recipe! Just so everyone knows, one can use chocolate in stead of chocolate chips that have extra stuff in the that isn’t needed. I prefer mine to have 1/3 milk chocolate and 2/3rds semi-sweet chocolate. 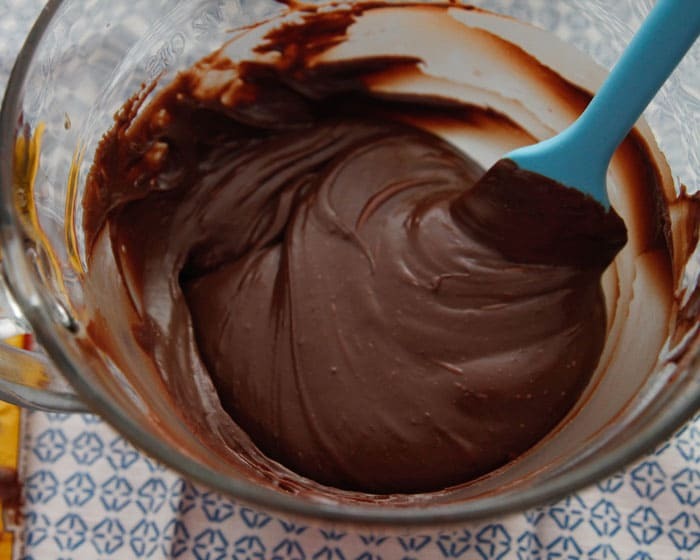 I make this all the time u should add a pinch of salt every time using chocolate it makes a world of difference. Also I make rocky road fudge using this as the base add peanuts salted, raisins, and mini marshmallows (since I have the salt from the peanuts i don’t need to add any extra). I have also swirled peanut butter and Nutella it the mix. Love all those additions. You’re so right, adding salt does make it better! I had no idea that making fudge was so easy and so few ingredients. My mom is visiting us and guess what she wants? FUDGE! Will be making this tomorrow after a trip to the grocery store for sweetened condensed milk. Thanks for sharing your recipe. sounds delish & really easy; will make some in honor of joan. rip & ty for everything! I am really sad to hear of her passing. I got plenty of tips and great recipes! May you rest in peace and your family be at peace in due time. Loss is never an easy thing.